mmm… Chocolate. Last Sunday was the 3rd Annual LA Chocolate Salon in Pasadena. I’ve finally come out of the sugar shock enough to share my experience but my hands are still too shaky to type it all out, figuratively speaking. So I’m going to do the next best thing. 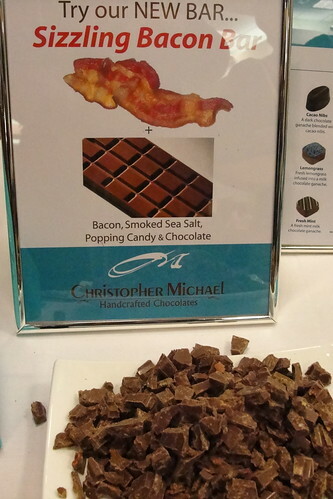 Here’s A Salon of Indulgence, Luxury and Chocolate, an article from the Occidental paper, Oxyweekly, which details the event in a way that was fairly close to my experience. If you missed this event, the next Chocolate Salon is in San Francisco. Chocolate lovers planning to be in the Bay Area in March, don’t miss that one. There will be as many as 50 chocolatiers in attendance to LA’s 35– which had one more sample table than this chocolate fan could handle. This entry was posted on Monday, October 19th, 2009 at 6:40 am	and tagged with chocolate, dark chocolate, gourmet chocolate, la chocolate salon, los angeles, pasadena, spicy chocolate., sugar and posted in Uncategorized. You can follow any responses to this entry through the RSS 2.0 feed. « Goal for October: read a book! ooooo! think I might have to plan my next vacation during that time. Thanks!